Some ammunition was carried in their tarpaper covered cardboard containers on the firing deck of the M105. Ammo was also stored under the steel floor boards of the M7 track vehicle. Additional ammo, along with all of our extra equipment, such as barracks bags and blankets, were carried in an attached trailer. The normal crew for a gun consisted of 12 men. Six men were designated as the "active" crew, and six were designated as "reserve". Only 3 men were actually needed to aim, load, and fire the gun once it was in position. The driver, assistant driver, and back-up gunner would act as ammunition handlers, unpacking shells and extracting extra powder charges from the brass semi-fixed shell casing. For example, if we were firing a #2 charge, they would remove the cotton bags containing charges #3 through #7, and hand it to the loader. If ammo supplies on the gun began to get low, they would pass additional stocks up to the firing crew. During the Invasion of Normandy, at Utah Beach, the batteries would fire from the deck of the LCT's, with the Battery Commander issuing the "fire order". He received his orders from the Battalion Fire Direction Center, which was located on another ship, along with the men of the Headquarters Battery. Our M7's were loaded on the LCT's two in front, and two in back, each with their "active" crew. The "reserve" crews were located on other boats. As the front guns performed firing missions, the back guns also performed firing missions, actually firing high trajectory "over" the front guns! On the ground, once a fire mission was called, it took less than a minute to get into operational positions at the gun. We always had several rounds of HE (High Explosive) uncased from their containers and ready to fire. We would wait for the fire commands to come to us over a phone line from the Executive Pit. The fire commands would include the type of ammo (HE, Armor Piercing, Phosphorous, Smoke, etc. ), which powder charge to use (from #1 to #7), deflection, altitude (SI), and elevation. Once the commands were set, the tubes were rotated to the correct direction, and bubbles on the instruments were leveled. The loader (#2 Cannoneer) rammed the shell into the open breech and up into the tube. At that point, the #1 Cannoneer closed the breech block, and grabbed the lanyard. The next command might just be a simple "FIRE", to zero the gun in on the target. Once the target was zeroed in, the next command might be something like "5 ROUNDS, FIRE FOR EFFECT". The entire operation would take a minute or less, depending on how long it took to get the commands from the Executive Officer. Some of the worst fighting in the war took place in the hedgerows during the period June 26 to July 25. In the interim, prior to Cherbourg, A & C Batteries operated with 6 guns each. I think I must have been a member of one of those extra gun crews during part of that time, at least. I didn't pay much attention to the battery to which I had been assigned as long as I was part of a gun crew and doing my job as #1 Cannoneer. Battery B was reformed after Cherbourg was liberated. As far as I can remember, all Privates and PFC's pulled KP and Guard Duty. The Non-Com's pulled Corporal of the Guard, or Sergeant of the Guard duties. Guard duty was handle in the established manner; 2 hours on and 4 hours off, throughout the night. In truth, I can only remember 2 stints on guard duty: one in Luxembourg, during the Battle of the Bulge, and one in the Hurtgen Forest. I don't think there was a regular routine of standing guard duty. Logic tells me there must have been, but evidently I was not involved, so I just don't remember. I can only remember 1 KP duty. Most of the time we lived on field rations that we supplemented with items obtained for cigarettes, such as eggs, onions, and the occasional chicken. These things we cooked ourselves and cleaned up afterward. Once our attack bogged down and we entered a static situation, or a slow moving situation where we occupied the same gun position for an extended period of time, the Army provided us with pyramidal tents large enough to sleep the entire gun crew, along with fold up cots. We used these once it became evident that the Luftwaffe was a virtual non-factor and that we seldom got counter battery fire. This was in sharp contrast to the fighting in Normandy, where we took great pains to dig foxholes, or occupy previously occupied foxholes. As you can see looking at the above photo, we no longer dug in the guns. We pounded heavy steel angle irons to support thick logs around the gun pit. From September 1944 to May 1945, that would be our only protection from any shrapnel exploding in our vicinity. When we still had our M7,s we would duck under the track chassis. In retrospect, these practices seem somewhat foolhardy, but as I have said before, all of us had adopted a fatalistic attitude and it just wasn't worth our while, or the energy to dig in. As long as the officers did not insist on us doing that, we were not going to do it! There was one exception, however, in Hurtgen. We occupied fairly large, fairly deep bunkers covered with logs and turf. We also put tarpulins over the turf to keep out the rain. During these relatively static periods, the field kitchen would be brought up, and hot meals would be served. It was during this period that I remember doing KP, and my only duty was to act as a server in the chow line. I believe the Mess Sergeant had his own crew who did all the other things, such as heating water for washing and rinsing mess kits. There were no floors to wash, no potatoes to peel (dehydrated were used), so the only really menial tasks were washing pots, pans, and utensils. I think the Mess Sergeant and his crew handled that. Each gun battery had a Supply Sergeant and crew, and they did a lot of things that the gun crews were not called on to do. Between fire missions, we would build smokeless fires using the tarpaper cardboard containers that the shells came in. We would start the fires with a small amount of gasoline and then feed the flames by throwing surplus powder charges into the fire. We would leave enough men to operate the gun, in case of a fire mission, and wander around the area contacting locals (except in Germany because of the no-fraternization edict), and looking for souvenirs. This last activity sometimes ended in tragedy, as when one of our men moved a dead German who had been booby trapped. It resulted in his death and severely wounded his companion. I think he must have died from the concussion, because there was no blood in evidence and his clothing was not in tatters, or otherwise visibly torn. Of course, there was the ubiquitous poker game. Writing letters, personal hygiene, reading Stars and Stripes, and Yank. On Skyline Drive, we even had a "Siegfried Cinema" set up for us. The movies provided were from the bottom of the Hollywood barrel, just like the cigarette brands we got were mostly the leftovers from what was first picked over by supply and other rear echelon troops. We also spent time preparing ammunition to be fired, and of course maintenance on the guns, vehicles, and our own weapons and equipment. Letters being sent back home were delivered to the battery clerk, who passed them on to an officer who, among his other duties, was the designated censor. They were then sent on their way to the APO for transfer to the States. Letters and packages were delivered to us by the battery clerk, and we had mail call at least twice each week. One other thing I should mention is that we did not buckle our helmet straps under our chins. We buckled them behind the back of our hemet, so as not to die from the strangling affect of concussion from a close explosion. Also, our helmets were used for heating water for shaving, and washing socks and underwear. In closing, let me say that compared to the riflemen, and other front line soldiers, we had a relatively comfortable time of it. How most of those men survived the horrible living conditions of rain filled foxholes and freezing, or near freezing weather in addition to the terror that they must have felt when launching an attack against a well dug in and deployed enemy is hard even for me to fathom. Yes, I was in some danger for most of the war, especially on D-Day and the early stages of the Normandy Campaign. But my death, if it was to come, would most likely be unexpectedly from shrapnel from a mortar or artillery round, and not from small arms fire while attacking an enemy strong point. Irving Smolens and Gun Crew! 8th Infantry Regiment's spearhead attack to break through the German lines. The attack was code named Operation Cobra and is better known as the St. Lo Breakthrough. In the left foreground, under the camoflage, if you look closely you will see the outline of a soldier. That is I.
I remember the smoke from the bombs dropped by our dive bombers seeming to drift in our direction. It was only later, that I learned of the tragic bombing of our own troops and the killing of General Leslie McNair. Despite the terrible damage done to our attacking force, the 8th jumped off as scheduled and penetrated 8 tenths of a mile into the German lines. 22nd Regiment, riding on the backs of the tanks of the 2nd Armored Division. It was the onset of the total liberation of France and assured our ultimate victory over the evil that was Nazi Germany. Irving Smolens Prepares to Fire His Gun! 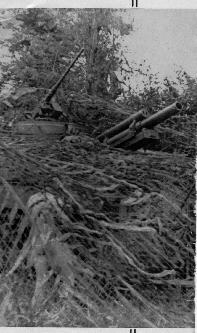 Above is a photograph of me as a "one man gun crew" in the Hurtgen Forest in November, 1944. During this period we would fire interdictory rounds at staggered times at suspected German positions and road junctions that they used. The gun would be set at a fixed deflection, altitude, and range. One of the crew (mostly it was I) would interupt whatever he was doing to go to the gun, pick up a round, load it in the breach, close the breech, then jump over the right trail, grab the lanyard and fire the round! Irving Smolens, seen in the foreground above, when this photo was taken on May 7, 1945, south of Munich, about six miles from the Austrian border. Germany had actually "surrendered", but the surrender documents were not signed until the next day, hence, V-E Day was May 8, 1945.